Following a weekend foray into DIY fix-it, I am lamenting the demise of my sewing machine. Yes, a lost screw was retrieved from the depths of the machine (and I am most grateful for reader advice - thank you all!). And yes, I did manage to reassemble her. I even miraculously preserved her ability to stitch. But in the process I introduced the sort of loud hammering that one associates more with carpentry than chain stitching. Ooops. So I'm admitting defeat: sending the machine away; ignoring The Great Pile of Unsewn; and switching projects. Given my current dose of inept-fumble-fingeredness, I have settled on something chunky: Kirsty's wonderful hexagonal Granny Shrug. I have never crocheted anything more than dodgy granny squares, so I am taking my instruction from her excellent video tutorial and Lara's fantastic downloadable pattern. 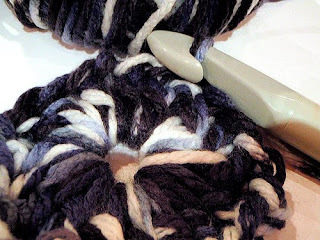 After a bit of experimentation (read: unravelling), I am crocheting with two stands of super bulky yarn. The work is most enjoyable, but of gargantuan proportions. See the hook up there? Its almost the diameter of your arm. And frankly, the yarn is the thickness of a garden hose. I am feeling a bit like the tiny version of Alice down the rabbit hole ( ... and of course ever hopeful of finding a piece of cake labelled Eat Me). Ouch ... I hope you get your baby back soon in one glorious piece. I like the hose/yarn you're using! Good luck wrangling your hook! Oh no! The hammer sound is never good... I hope you find some delicious cake about the place! I hope you get your maching back soon. Happy hooking in the meantime. I am intimidated by the idea of a crochet hook as thick as your arm. Frankly those arm-diameter hooks scare the bejesus out of me - even more than zip installation (even though I now know zip installation is easy peasy lemon squeezy, I am still carrying emotional zip baggage). ... when it comes back it will be exctiing... meanwhile I think its good to swap the craftiness around a bit... I tend to have a few things on the go at once... keeps me more intersted.. Can't wait to see the end result. I hope you get your machine back soon!! and have fun with your crocheting!! Oh I know the pain of not having a machine, but look how multi-skilled...well maybe oversized-skilled...you are becoming! So sorry to read that your machine is not doing very well, hopefully it'll be fixed and back in action real soon! oh no, hope you machine comes back raring to go soon! good luck with the hooking! Hmmm. After the recent demise of my own machine, I may have to join you down that rabbit hole. Although by the sounds of it, the hook and yarn won't fit down there... terrifying. That is one massive hook, my little hooks all looked at it and were very frightened and felt quite inadequate. Arghh! You poor thing- I can't imagine being without my sewing machine. Have fun with the crochet. Woops! Hope your machine is salvagable. Good luck with the shrug! Go you and your crocheting goodness.I am so jealous - cant wait to see it in the flesh! I particularly like the Product description and the fact that the cover project features the symbol for First Aid. Hope the machine is better soon. I do NOT crochet, looks far too complicated. Hello! And thank you for the lovely visit to my blog!!! I'm very excited you're making the granny shrug... its on my very long list of "to-do" projects so I'll look forward to checking in on your progress!!!!! Creative thursday is fantastic isn't it?! Sorry about the machine but hooray for the huge hook & having a crack. I can't wait to see yours finished. Good luck. Looking forward very much to seeing the end result. ... and wishing your sewing machine a very speedy recovery. So sorry to hear about your poor machine but yay for a bit of crochet. I bought a 15mm hook today to have a bit of a go at the shrug and I know exactely what you mean about the thickness of your arm. I am totally intimidated. It feels like a new craft altogether. Can't wait to see you in yours.